Most dietary sensitivity in dogs happens when the immune system mistakenly identifies a food protein as a foreign substance and attacks it as if it were a harmful pathogen. With repeated exposure, the body incrementally mounts defenses against this “foreign” protein, often resulting in gastrointestinal or dermatological signs. Which Foods Are Dogs Most Sensitive To? Food sensitivities can be associated with several ingredients but are most commonly associated with proteins. Dogs can be sensitive to animal-based proteins, such as beef, dairy, egg and chicken products. In grains, such as wheat, barley and rye, the presence of a protein called gluten can cause food sensitivity. How Can I Tell If My Dog Has a Food Sensitivity? Warning signs of food sensitivity might include itching, licking of the feet, chronic ear inflammation, sensitive skin or gastrointestinal problems. Many other medical conditions have similar dermatologic and gastrointestinal signs. So, your veterinarian is the best resource to consult when trying to determine whether your dog has a food sensitivity. How Can a Grain Free Diet Help? Most food sensitivities do not result from exposure to grains or gluten, but there are a few rare occurrences of grain sensitivity. Because it’s difficult to isolate the exact protein in a mixed diet, novel protein sources and limited ingredient diet formulas can be beneficial for pets with food sensitivities. When selecting a grain free diet to help manage a dog’s food sensitivity, look for novel single-source protein and a limited number of protein sources. Novel animal proteins are proteins not as commonly consumed by dogs. This might be different for each individual dog depending on the dog’s nutritional history (e.g., lamb would be a novel protein to a dog who has routinely been fed beef or chicken). A limited ingredient diet uses a minimal number of ingredients or ingredient sources. This usually includes a single animal protein and a single carbohydrate source. A limited ingredient diet with a minimal variety of proteins will help lessen the chance that the food contains a potential allergen. Feeding a grain free dog food that also is a limited ingredient diet with a single, novel animal protein source has great potential to help reduce the likelihood of food sensitivity in dogs. What’s Unique About NUTRO™ Grain Free Dog Food? Not all grain free dog foods are alike. 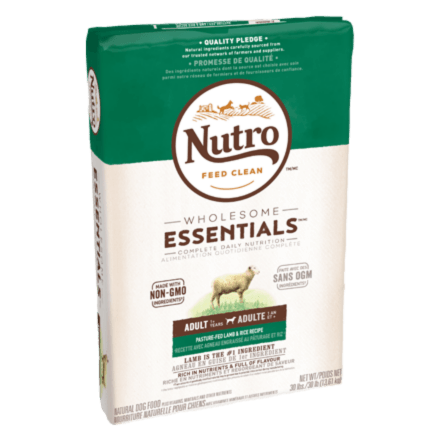 Try NUTRO™ Grain Free Dog Food, a natural answer for food sensitivity. Our grain free formulas use both limited ingredients and single, novel animal proteins, such as venison, turkey, fish and lamb. By limiting the number of ingredients and providing the right balance of fibres, these nutritionally complete formulas help promote optimal digestive health in dogs with sensitive stomachs. In our dry grain free formulas, we include optimal levels of linoleic acid, zinc and B vitamins to guarantee** healthy skin and a soft, shiny coat. Let your dog be a dog with better digestion and improved skin and coat health.